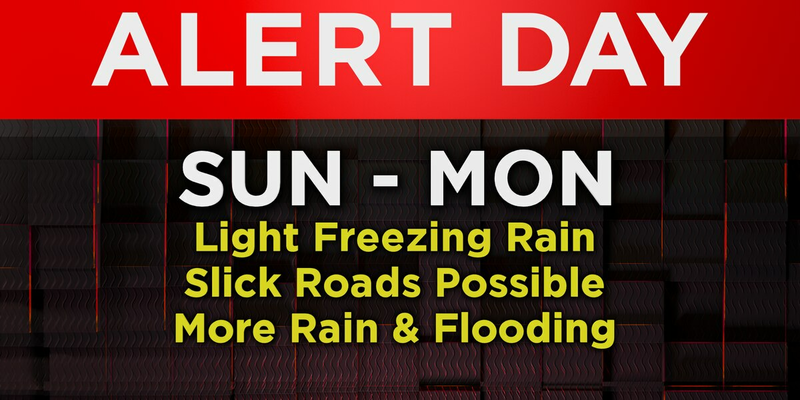 EVANSVILLE, IN (WFIE) - We are on alert for freezing rain and wintry mix this morning followed by more rain and possible flooding tonight through Monday night. Most of the Tri-State is under a Winter Weather Advisory until noon today as freezing rain, possibly mixed with light snow, will likely cause some minor ice accumulation and slick driving conditions this morning. However, when that advisory expires at noon, a Flood Watch goes into effect and continues until 6 a.m. Tuesday. That wintry precipitation this morning will change over to all rain by midday as temperatures climb to around 40° this afternoon. Rain will then remain likely from this afternoon all the way through Monday and into Tuesday morning. Much like our last round of rain, a total of 1.5-3” is expected across the Tri-State. Keep in mind, with rivers already flooded, and most of our creeks, streams and low-lying areas still in recovery, there won’t be anywhere for that much rain to go, so flooding issues are expected. The good news is that the warmer weather will also be returning with that rain. High temperatures will make it to around 50° Monday and will climb into the low to mid 50s Tuesday. Wednesday will be mostly sunny with high temperatures in the upper 40s to low 50s, but there is more rain in the forecast Thursday afternoon and evening that could change over to snow or wintry mix on Friday. Arden joined the 14 News team in April 2018 as the weekend meteorologist. She is thrilled to be back home in the Tri-State.